Sponsored by the Center for Women at Emory and the Emory Alumni Association, the Women of Excellence Awards honor achievements by faculty, staff, students and alumnae. This year's awards are March 17. Photo by Tony Benner. Thursday, March 17, 6:30 p.m.
Free and open to everyone. Please RSVP. From teachers to theater performers, the winners of this year's Women of Excellence Awards have something in common: extraordinary dedication to issues that affect women at Emory or in the larger community. "These individuals have served as mentors, thought leaders and educators. They have gone above and beyond to make a difference in the work that they do," says Tiffany Del Valle, program coordinator of the Center for Women at Emory. The Women of Excellence Awards are sponsored by the Center for Women at Emory and the Emory Alumni Association. They will be presented on Thursday, March 17, at 6:30 p.m. at the Miller-Ward Alumni House. 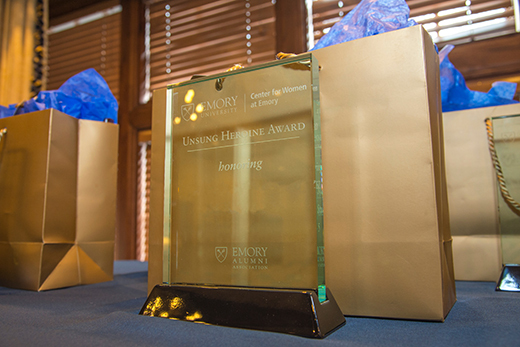 The award ceremony, formally known as the Unsung Heroines Awards, has expanded to honor individuals from all corners of the University in several new categories including Program of the Year, Public and Digital Scholarship, Mentorship, Excellence in Pedagogy, Leadership, Outstanding Alumna, and of course, Unsung Heroine. In addition to the award winners, graduating women of excellence will be honored in a private pinning ceremony that evening, including undergraduate and graduate women. “We will also have a performance from the all-women a capella group, The Gathering, as well as a ‘Year in Review’ presentation video," Del Valle says. This event is free and open to everyone. Please RSVP. For more information, contact Tiffany Del Valle. You can also learn about past Unsung Heroines honorees. As a professor of sociology and global health, during her time at Emory, Kathyrn Yount has advised seven postdoctoral fellows. Her mentorship has encouraged students at all levels to pursue their passions in issues related to gender-based violence, maternal and child health, gender and the family, and qualitative and quantitative research methods. She formed GROW! (Global Research on Women) in order to connect students, faculty and staff working on these issues and to publicly recognize the publications and accomplishments of GROW members. In this way, Yount has not only provided mentorship to her students, but has also created a supportive scholarly community. According to her many nomination letters, Amy Elkins has a reputation for being an excellent classroom teacher and a campus leader in humanistic education. Elkins successfully applied for a Center for Creativity and the Arts grant to fund tickets for her students to attend Atlanta’s High Museum of Art's recent Cezanne exhibit. Moreover, she then combined this initiative with her successful grant from the Center for Faculty Development and Excellence for art supplies allowing her to supplement the class readings with craft workshops. This extra effort gave students hands-on experience with painting, sculpture and photography. She exemplifies excellence and passion through her teaching and is a role model to many. Lynell Cadray has committed her entire career to advancing the causes of women. While working as dean of admission at the Emory Law School from (1994-2009), she mentored many women who had an interest in law school and becoming lawyers. She spent numerous hours working to develop programming specifically with the national Law School Admission Council to provide opportunities for underrepresented students and women to join a profession that was difficult to enter. After leaving the Law School, Cadray began to work in the School of Nursing. There, she developed student leadership programming and developed academic assistance programs, writing programs and career based programs so that students would have the opportunity to develop skills beyond their academic and clinical training. She served as an advocate for underrepresented women pursuing degrees in nursing. She has impacted many people through her service at Emory and currently mentors at least nine students. An assistant professor of global health, Evans effectively led a team (GHI Brazil 2016 Team) to research intimate partner violence and health care provider interventions, and guiding them in grant-writing, scale-building, and project planning. As the director of both the Institute of Human Rights and the Center for Humanitarian Emergencies, she contributes towards the continued global presence of Emory in key arenas of public health that affect women. From its inception more than 40 years ago, the Obie Award–winning "for colored girls who have considered suicide/when the rainbow is enuf" has excited, inspired and transformed audiences all over the country. Directed Troizel Carr, an Emory College senior at the time and now a staff member, this adaptation was brought to life by a remarkable cast and crew, including Samantha Scott, Chelsea Jackson, Shala James, Zana Pouncey, Jasmine Walker, Dalyla McGee, Krystyna Jordan and Annelise Bonvillian. This cast did an excellent job of delivering their lines but also pulled the audience into their pain and their joy. Carol Anderson is chair of African American Studies and History and is a leading thinker of race in America. She served as one of the Center for Women Public Voices Fellows through the OpEd project and has been one of the most successful participants, including national media appearances. On the 50th anniversary of Brown v. Board of Education she published an article interrogating the current race and class disparities in the education system. When 17-year-old Jordan Davis was killed under Florida’s Stand Your Ground law, Anderson wrote a piece arguing that the assumption of white innocence has an immense toll on public safety. When instances of racial injustice occurred at the University of Missouri, Anderson penned a poignant piece historicizing the history of racial injustices at the institution. She epitomizes what it means to be a women of excellence in public scholarship. As an alumna, Bruner has been devoted in her service to her alma mater. She served as president of the School of Medicine Alumni Board, as well as a member of the Emory Alumni Board, and remains active with Emory as a member of the Alumni Presidents Club and an emerita member of the Health Sciences faculty.